Last weekend, some druid friends came over for a retreat with a focus on land healing. As part of the ritual we collaboratively developed, we wanted to make an offering to the spirits of the land. I went to my sacred tobacco patch and carefully gathered leaves drying at the bottoms of the plant and flowers for use in this offering, humming a song that the tobacco had taught me and making sure that none of the leaves hit the ground in the process. The ritual went beautifully well and the offering was well received by the spirits. 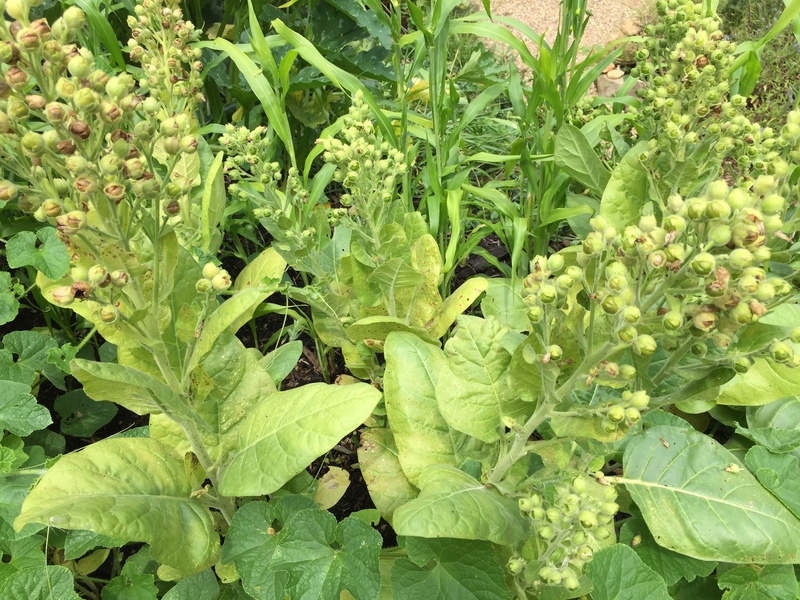 After the weekend, it struck me how long my relationship with these particular tobacco plants was–more than a decade at this point from seed to leaf to flower to seed. And how I had something to share about cultivating this relationship over time. So I thought I’d take a short–yet related–detour from my “connecting with nature series” to talk about plant spirit and plant relationship work, specifically tied to Lughnassadh, and building sacred relationships with plants over time, using the wheel of the year and wheel of the seasons. Lughnassadh is an ancient Gaelic festival still celebrated in Ireland, Scotland, and the Isle of Man. Of course, Lughnassadh is also a holiday celebrated by many druids and other neo-pagans today as part of the wheel of the year. While traditions vary from region to region and group to group, it is largely agreed upon that Lughnassadh always was and is a “first harvest” festival. In my neck of the woods, early August is just when some of the most important crops are coming into season: tomatoes, peppers, cucumbers, wild berries, elderberries, and more. I’ve come to see Lughnassadah as a festival dedicated to the plant kingdom, not only because of the abundance that the plants produce this time of year in temperate climates, but also become of my long-term work as an herbalist. As I wrote about some years ago, Lughnassadh is a perfect time to make sacred plant medicine and harvest herbs. The power of the sun is energizing, the herbs are in full bloom and many are at the peak of their growing, and the weather is warm for wandering among the weeds. It is after that moment in early August that we start seeing die back and die off of many medicinal herbs as the fall grows nearer and nearer. Today, though, we aren’t just talking about any herb harvesting–we are talking about cultivating deep relationships with one or more plants on a long-term, perhaps lifetime journey. 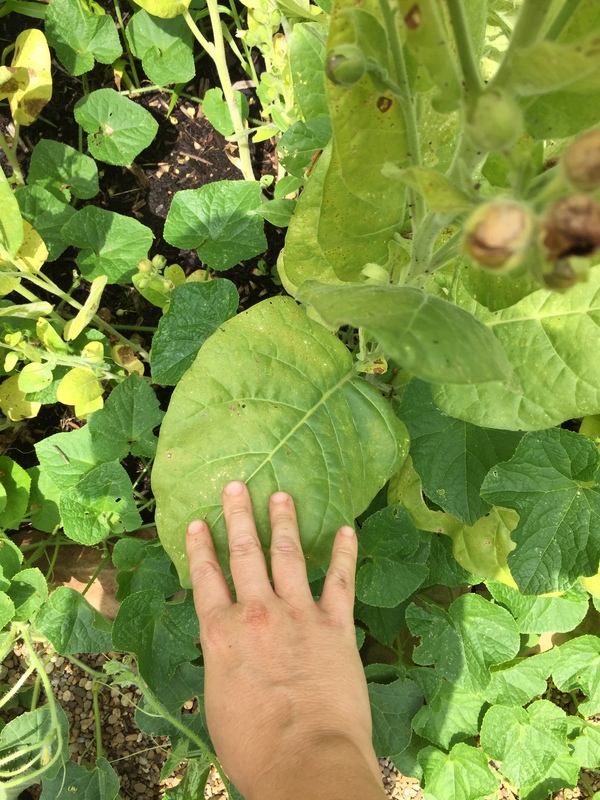 I first share my story of the sacred tobacco that I have been growing for over a decade, and then share ideas for you to start cultivating your own deep relationship with a special plant. I remember tucking the small packet of seeds, a gift from a gardener, herbalist, and wise woman, into my bag ever-so-carefully. A gift like this was meant to be cherished, and I couldn’t wait till the next spring when I would be able to start some of the seeds. Like little specs of dirt, the tobacco seeds called to me, “plant me, plant me, give me good soil” and I assured them that all of this would come to pass. In the spring, after opening up a sacred grove for planting (something I do regularly with my spring seed starting) I scattered them on some growing trays, and covered them with the finest layer of soil. They sprung up almost immediately, with almost 100% of them germinating, their little fuzzy green leaves reaching toward the light. Within two weeks, I transplanted them, and they grew quickly, getting big succulent leaves and putting up stems. I transplanted them again, and they grew even bigger. By the time the last frost had come and gone, they were in large plastic cups straining to get in the ground. I created a special wheel of the year garden for them in a warm and sunny location and into the ground they went. 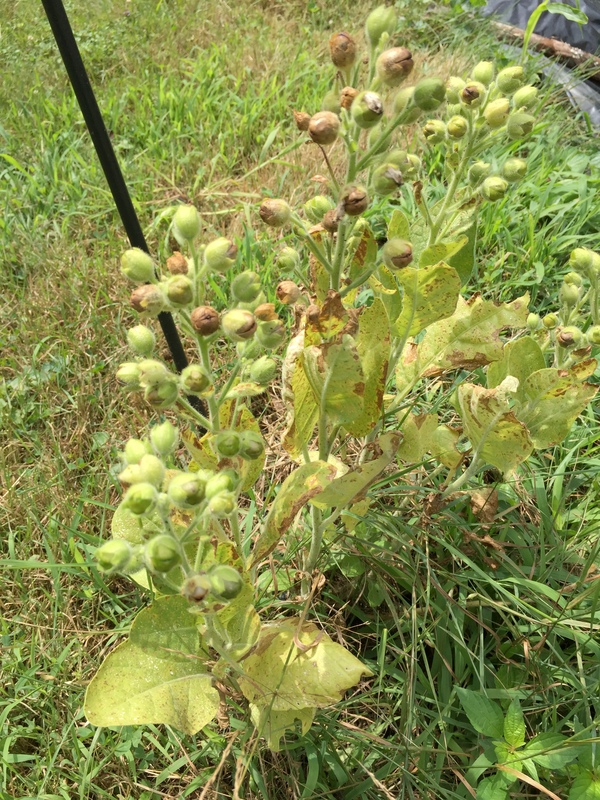 The continuity of the seed….tobacco pods ready to harvest. Its fun when you are growing a new plant for the first time; all the photos or descriptions in the world never substitute for the plant itself and its glorious spirit. This is especially true when you don’t even know what the plant exactly is! I hadn’t grown tobacco before. My tobacco plants, the 15 or so that took root, were delighted with their new space. They put on leaf, and then, grew masses of beautiful little flowers that looked like elongated yellow parasols. As the flowers grew ready to fall off, the plant told me to harvest them and dry them, and I did. The flowers turned into large seed pods, which eventually grew brown–along with the rest of the plant–and burst open, self seeding for the following spring. At Lughnassadh that first season, I carefully harvested the leaves and lay them in the sun to dry–since my intention was an offering tobacco, something grown solely as an offering to the land and not smoked–I didn’t have to worry about the complexities surrounding the curing of tobacco. I later learned that I wouldn’t have wanted to either way, as this variety has an extremely high nicotine content (and I am not a smoker, ceremonially or otherwise). I let the leaves dry out and go brown and yellow, and then crumbled them up, added the flowers I had already saved, and stored it all in a jar. I created a little leather pouch and filled the pouch with the tobacco, and went off to make some offerings. The land loved the offering and asked for more and more, so I carried the pouch with me and used it often. I saved the seeds and began sharing them with some people I felt drawn to give them to. I saved the stalks and used them in my smudge sticks. This is the same tobacco (and later, tobacco blend) that I recently talked about in my Beltane Offering Blend post–that blend is my current favorite for creating an offering. Later, I learned that these seeds were nicotinia rustica seeds, also known as “wild tobacco”, “shamanic tobacco” or “Aztec tobacco.” It is native to North America (and hardy to zone 8), but is no longer widely cultivated in the Americas because the more common tobacco, nicotinia tabacum, is what is now prized and grown. Nicotina Tabacum is much less harsh, with 1-3% nicotine content, which is what people smoke in cigarettes and pipes. Rustica, on the other hand, has up to 9% nicotine; in some places in the Americas, it is used as an entheogen or as one of the ingredients in herbal blends that also contain Ayahuasca (likely, this is why it is called “shamanic tobacco”). 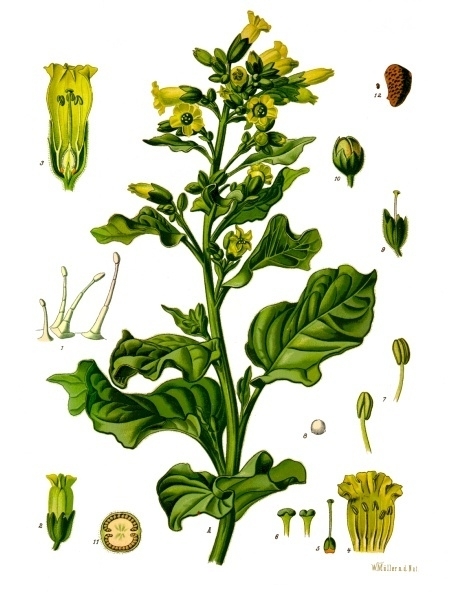 It is believed by some South American Shamans that tobacco is a plant that gives you access to the spirit of many other plants; it is like a gateway plant to the deeper plant mysteries. I have found this to be true, even though I only use it as the plant has directed–as an offering. Each year I had a garden, I planted this plant, and gave it a privileged space. If I planted only a few things when I didn’t have a garden, my tobacco would always be planted first to be planted. And each year, I saved seeds. Each year, I kept my pouch with me and offered the tobacco regularly to the land–and it was always extremely well received. Over time and over various harvests, the plant shared some of its deeper mysteries with me, a song for harvesting, for example. Now, when I start new seeds in the early spring, the first sprouts are like an old friend, greeting me once more. I sing the songs, I sow the seeds. 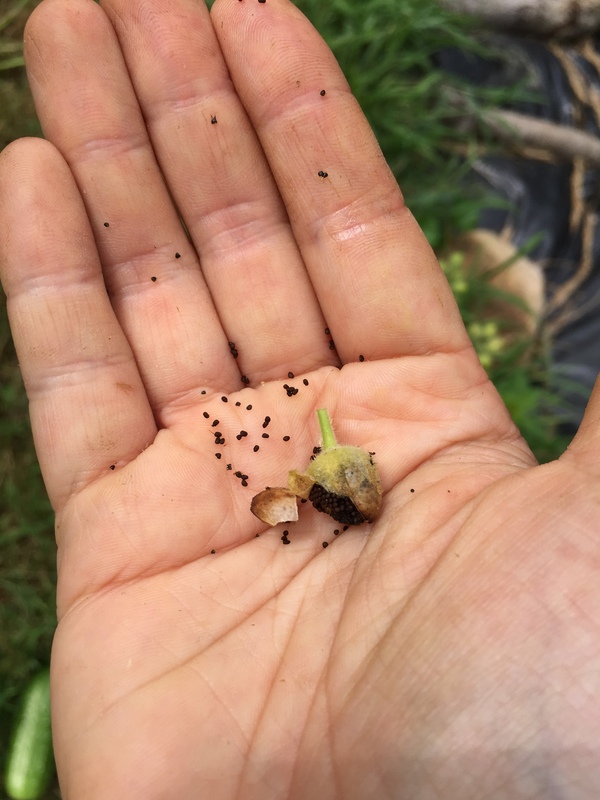 Since I save the seeds, my relationship with these particular seeds, this particular plant continues and persists throughout my lifetime, and in the many cycles of this annual plant’s lifetime. As Lughnassadh is here this week, I will continue my annual tradition of harvesting the plants as they go to seed, laying the leaves in the sun, and continuing this cycle into the future years. I will once again mix my blend and fill up my jar for the year till the spring when I plant again. My choice of tobacco originally wasn’t my own; they were gifts of seeds and I wanted to see them grow. But in retrospect, I am delighted that this tobacco is now so firmly in my life. I really like the fact that my sacred tobacco has only one use to me–an offering–and that use is critical for my interaction with the broader land. I also liked the idea of “reclaiming” tobacco from the ways that it has been abused (and grown in a toxic and unceremonial way) by my broader culture. So part of this work was “reclaiming” a native sacred plant, and part of it was building a brand new relationship with that plant that was my own, not built on any previous culture’s use. This isn’t my only plant relationship–each of the relationships is unique and its own. But this is certainly one of my more potent ones, and therefore, is a good illustration of the larger technique I’m sharing today. Beautiful Nicotiana rusticas growing in the garden! So here’s a simple technique you might do, based on what I’ve written about above: choose a plant to cultivate a deeply sacred relationship with. Plan on this relationship spanning a period of time, years or decades, if possible. Rituals and sacred actions have meaning in part because we repeat them; the more repetition we have over the years, the deeper the connection and meaning. I would recommend choosing a plant that has some sacred use to you and that you can grow, even if its in a pot or on a sunny windowsill. For the method I offer above, I think the cultiavation of it is important. If you aren’t cultivating the plant, I would suggest one you have regular access to, and that you can “tend” in some way (pruning, scattering seeds, etc). Spend some time selecting your plant–there is no rush. The plant will be there when you are ready. Your plant has lived hundreds of thousands of lifetimes, she will wait for you to be ready to begin this work. In my case, I had no previous relationship with tobacco at all (and had avoided my culture’s use of it); but for other plants I work with in this way, I certainly have had previous relationships (sometimes spanning back to my childhood). By the time I do this work, they are already good friends :). Begin simply by planting your plant or finding it in the wild, watching it grow. If it doesn’t yet grow where you live, cultivate it. When you interact with your plant, especially for sowing and harvesting, try to do so in an open grove/sacred space. This helps establish, from the beginning, the sacredness of your relationship with this plant. Visit your plant often. Pay attention to how it grows, how it moves in the wind and how the rain washes over it. Learn your plant in the physical world: learn how it grows in each stage of its life cycle. If it is a perennial, watch it die back and be reborn in the spring. If it is an annual, carefully save its seed each year and plant again to bring your sacred relationship with you as the years go on. Learn what pests may eat it and how to prevent those pests. Connect with the plant in spirit. Listen for the plant’s inner song (each plant has a song, and may reveal that song in time to you). Find out if the plant has a sacred name she wants you to use–and call her by that name. Find out if you can use that name with others, or if she wants you to keep it to herself. If you can consume part of the plant, do so, and see how it works within you. Do some meditation after consuming your plant; see how it feels and what it reveals. If you want to get even more radical, do a fast and consume only the plant (or tea from the plant) if it is edible; let it sustain you (again, Buhner’s work on fasting may be helpful to you here). Find your sacred harvesting time–perhaps it is Lughnassadh, perhaps some other sacred day on the wheel of the year or a full moon. Discover how the plant wants to be harvested and prepared; use your intuition and go with the flow of it. Use the plant respectfully, taking just enough to get you to the next harvest (perennial) or saving the seeds carefully (annual). Let the years pass, and continue to build your relationship with the plant. Be slow to speak of this work, and speak of it only when directed by the plant (as tobacco has asked of me); this will keep the magic between you and the plant. As the years pass, you will grow quite close–and your sacred plant will always be there, with you, offering her quiet presence. The plant will help show you the way to her magic, her stories, her songs. All that you need to do is begin with an open mind, patience and perseverance, and let her guide the way. Blessings of the plant kingdom this first harvest season!